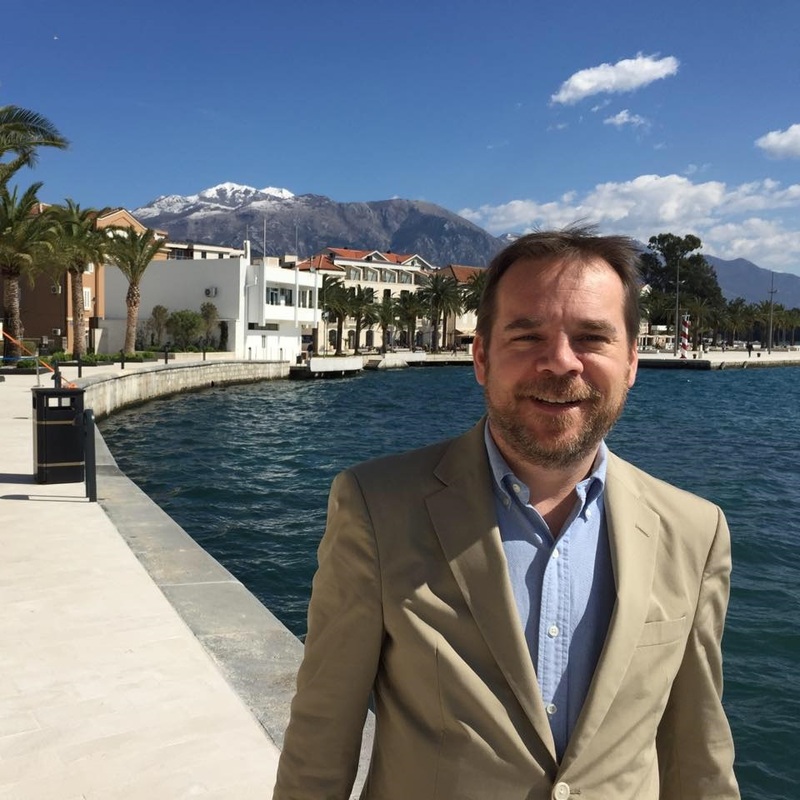 Tell us what you are doing in Montenegro…. I’m serving as the Senior Election Advisor to the State Election Commission (SEC) through an agreement with the OSCE [Organization for Security and Cooperation in Europe] Mission to Montenegro. The Mission contracted with me to embed with the SEC to assist with the preparations for their upcoming parliamentary elections scheduled for October. My contract is the second part of a multi-year program designed to build the capacity of the SEC. Montenegro has only been an independent country for 10 years (May 21 is the 10 year anniversary). Prior to this year, the State Election Commission administered elections on an ad hoc basis borrowing staff from other governmental agencies. In 2015 legislation was passed creating a permanent commission with full-time staff. Since few commissioners and none of the staff had prior elections experience the OSCE agreed with the commission to create this project. Not only am I working on assisting the agency create election administration practices from the beginning I am also advising on the implementation of the electronic voter identification device (EVID)-their version of electronic pollbooks. We were fortunate that local elections had to be held on April 17 in the municipality of Tivat. This election allowed us to pilot the equipment, the multiple training materials and videos and fine tune the program for the parliamentary elections. We are currently in the “lessons learned” process and will soon be doing a technical audit of the remaining municipalities so that we can see what equipment and facilities will be needed for individual classes. The training of local polling board members for the parliamentary elections is a large task for any election organization, let alone one that has only been in existence for 7 months. For this organization, the task is monumental. The SEC must train over 12,000 polling board members on the laws of the election and how to use the new EVID technology. Because, by law, polling boards are not required to be formed until 10 days before Election Day you can imagine the hurdles the SEC has in front of them. We have to develop a simple yet effective program that we can use to train over 12,000 people in eight days. We intend to use a large “train-the trainer” program with site monitoring by the commission, staff and civil society organizations to measure consistency in delivery and content. Unlike technical implementations in the United States, there is no vendor support on this project. The State Election Commission and the Ministry of the Interior(MoI) were left alone to design the materials and program. One of the things that made me attractive for this project was my experience with multiple implementations in the United States as well as my experience in international election analysis. Biggest surprise (pleasant or unpleasant)? Biggest challenge? The biggest surprise of the project was the lack of vendor support for such a large project. Because I have been involved with several implementations I know the value of a solid partnership between vendor and customer. We have been able to overcome this because of great cooperation between the MoI and the SEC and the eagerness of the staff to meet the challenge. The biggest challenge is going to be developing the logistics and personnel needed to train over 12,000 people in ten days. The SEC will be stressing to all political parties and Municipal Election Commissions the need to name local polling boards as early as possible so that training may begin before the 10-day window. Because the law allows for the appointment to occur at such a late date our expectation will be the 10-day window. Anything greater than that is just bonus time. This is obviously a much less high-stakes assignment than your previous work in places like Afghanistan – what, if anything, did you take from those experiences that helps you here? Well, I’m not sure that my experience with my “misadventure” in Afghanistan helps as much in election administration so much as life itself. Keep your head on and run when you have an opening is always good advice in a conflict zone. I’ve had some tremendous experiences overseas. I’ve seen a few stolen elections. In Egypt I observed elections with tanks and military vehicles parked outside. One of my polling locations in Georgia was robbed of its ballots at gunpoint by a candidate who assumed that if he could stop the election he would just retain his office. In Nepal, a political party would temporarily “kidnap” voter registration officials and destroy their equipment to prevent citizens from registering. In Afghanistan, people died. Election administration shares similarities across the world. Overall, the experiences I have, both in the United States and overseas, gives the State Election Commission the confidence that my advice is rooted in being a practitioner and not just a ‘consultant.’ I am able to speak to the SEC “in their language” and they know that I have faced many of the decisions that they are. I can discuss plans and programs clearly to them and they understand that these are more than just suggestions. They are proven practices. What’s one thing that you wish your counterparts there had understood about election administration before you got there? I wouldn’t say that I wish my counterparts here had known this prior to my arrival but I am encouraging them to look beyond their own organization. We are taking a fact-finding trip to a neighboring country to grow the capacity to train. Membership and participation in international election bodies will allow the SEC to learn best practices. I often say “I can’t fix what I don’t know;” in other words, I can’t improve unless I know where to improve. I hope I leave them with the desire to learn more about election administration beyond their borders. As the SEC learns more about international election administration they can continue to improve their own capabilities and better serve Montenegro’s citizens. What’s one lesson you’ll bring home with you that can help American election administrators do their job better? Keep learning beyond your agency. The more exposure that you have to elections outside of your jurisdiction or state the better an administrator you will be. Maybe you can’t be involved in the Election Center or IAoGO [the new organization formed by the merger of IACREOT and NACRC] or afford your own state conference, but there are still ways to learn. Seek out webinars. Read electionline to get best practices or just to see the mistakes others make so you don’t duplicate them. There is no doubt that I am a better election administrator now than when I started my international work. I’m just looking for the opportunity to bring this experience back again to the United States. Any advice for election officials hoping to do the kind of work you’re doing? Well, first you can start with short-term election observation work. The easiest place to start is applying through PAE-React to be an STO [short-term observer] for an OSCE monitoring mission. PAE prefers to hire election administrators to do observation work, if possible. It is a highly competitive recruitment process and slots on missions are few. It may take a year or so to get selected. You need to have at least five or six missions in different countries to expose you to enough international practices before you can start offering analysis on longer-term missions. I encourage all election officials to get involved in election monitoring. One of my biggest complaints about the international circuit is that it suffers from a significant lack of practitioners. We bring a perspective to the process that you just can’t learn from consulting. We’ve often taken the lumps in our own positions and that makes our point of view very valuable. Thanks to Rokey for taking time out of his busy schedule to answer these questions … My friend and former mentor Roy Schotland had a favorite quote [which I’ve never been able to find] that recognized those people who “every day keep the world from going to hell.” Rokey Suleman is one of those people – here’s to a successful election in Montenegro, safe travel home and many, many more years in the electiongeek business. Be the first to comment on "Our Man in Montenegro: Q&A with Rokey Suleman"